Project Food Forest – Food For All. Food For The Future. We work to fill Sioux Falls with edible plants. 1 in 8 individuals in Minnehaha County are food insecure, lacking quality filling meals. A new public food forest will be breaking ground in Luverne, Minnesota this spring (2018)! The host, Kim Rockman, has been working very hard planning and coordinating the effort, which will be part of a larger conservation program on their property. 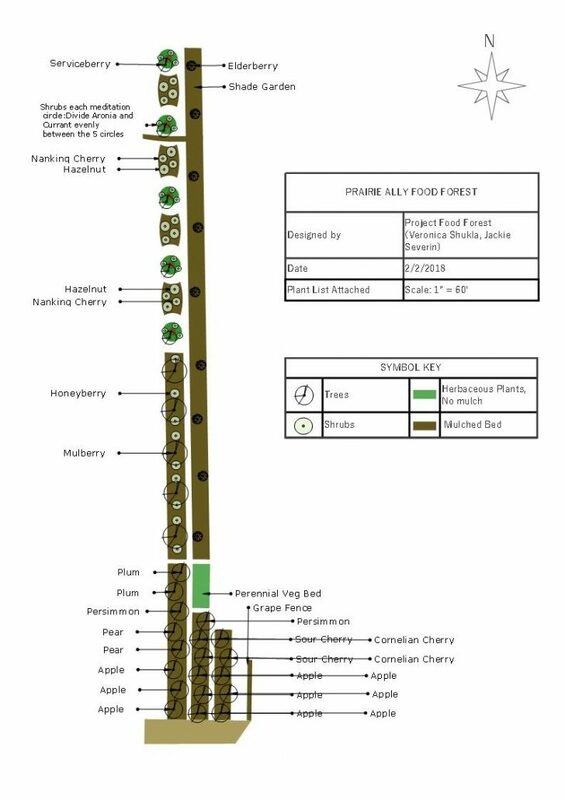 Here is a look at what’s to come at the Prairie Ally Public Food Forest. Look forward to coming volunteer opportunities for both this site and the Spirit of Peace site this spring and summer. Brick Photography for photographing the planting event at Spirit of Peace UCC. Please visit our Facebook page to view current videos and photos. We empower people to feed themselves through agroforestry, edible landscaping and education. Designed to operate as an ecosystem, a food forest focuses on trees, shrubs, vines, perennials, and self-seeding annuals that, once established, will need only a little help from people to be very productive. Our goal is to get as many edible plants as possible all over the city. We intend to do this by planting public food forests, designing low-maintenance edible landscapes for clients, and educating through classes. If you are interested in having an edible landscape on your home or even growing your knowledge of sustainability, we can help! You are also more than welcome to make a tax deductible donation to help our cause as well. Stay up to date on our work. Sign up for our newsletter now!